“Please pick up your binoculars, everyone,” Margaret Reimann says to the assembled group of fifth graders. She holds her own pair aloft. After a brief training and the inevitable using-the-binoculars-to-look-at-your-friend-who-is-two-feet-away, the students gather by the bank of windows in Ms. Reimann’s classroom at Lyseth Elementary School in Portland. Outside, Maine Audubon educators have placed laminated images of common Maine birds around the schoolyard. One student begins to describe a Black-capped Chickadee. The other students in her group listen, peer through their bins, and nod their agreement. 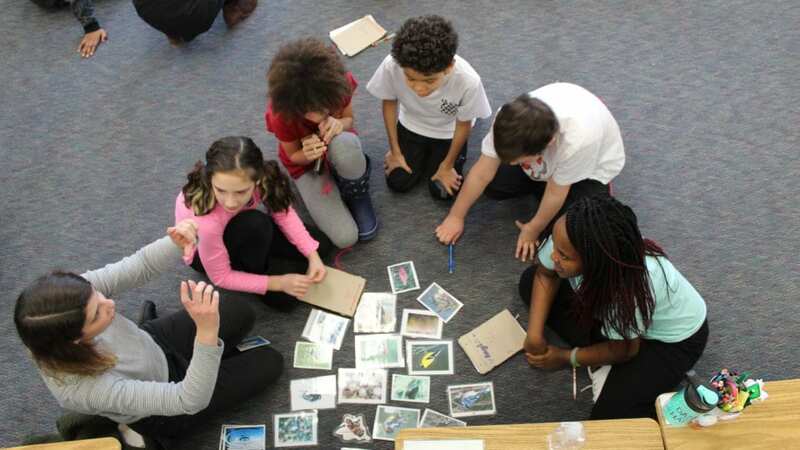 Behind them, three other groups of fifth graders are huddled at different stations around the classroom, each staffed by a Maine Audubon educator. At one, they’re studying bird biology, looking at bird mounts and measuring beaks and wings. At another, they’re talking about bird habitat, moving laminated photographs around to create the ideal environment for different species. At the third, they’re tapping away inquisitively on tablets, digging into apps like Merlin to hear bird calls and take their sightings to the next level. Every 20 minutes, they rotate. But it all starts in Ms. Reimann’s fifth grade classroom. Since Celebrate Urban Birds began in 2007, it has sought to make contributing valuable, observational data as simple as possible. As part of this longstanding project of the Cornell Lab of Ornithology, participants select a small plot — 50 feet x 50 feet — and monitor it for three days, for just 10 minutes each day. They are monitoring for 16 specific bird species that are common throughout the United States (additional, regionally-appropriate species can be added in, too). Then, they report their results to Cornell. It may sound easy (that’s the idea! ), but in order to monitor for these bird species, you first have to know how to identify them. And in order to select your plot, you have to learn at least a little about the types of habitat that attract different kinds of birds. That’s no accident. Karen Purcell, the Celebrate Urban Birds Project Leader at the Cornell Lab of Ornithology, observes that “once people participate, they begin seeing the world differently. They observe their habitats with more depth and curiosity, and they question more.” Purcell explains that Celebrate Urban Birds aims “to co-create inclusive, equity-based citizen science projects that serve communities that have been historically excluded from birding and citizen science. We seek to improve quality of life and create better science by including missing voices, perspectives, and experiences.” To achieve this, Purcell and her team provide bilingual educational materials, community trainings, and webinars — all for free. Today, over 575,000 people and 13,000 organizations have participated in Celebrate Urban Birds. Over 92 percent of these interactions have taken place in underserved communities. The project has participants in every US state, Canada, Mexico, and throughout the majority of Latin America. Ms. Reimann’s class is one of 10 groups around the country that is participating in a community science project as part of American Spring LIVE. Supported through a grant from the National Science Foundation, this project is bringing together 10 public television stations across the United States, each of which has joined with a local organization as a “primary science partner.” That’s how Maine Audubon and Maine Public Television teamed up — alongside similar teams from New Mexico, North Carolina, California, Florida, and Wyoming, among others. Join us on April 27 at Gilsland Farm for Maine Spring LIVE: Wildlife, Science, and You! Each team is training local community members in a participatory science project. Some states are focusing on monitoring Monarch larva, evaluating pollination by bees, or tracking lilac leafing and blooming. In Maine, Ms. Reimann’s class is learning to Celebrate Urban Birds. Then, on April 27, we’re teaming up to host a special family event — Maine Spring LIVE: Wildlife, Science & You! — at our Gilsland Farm location in Falmouth. Ms. Reimann and her students will be there to talk about what they’ve learned, and they’ll be joined by Maine Audubon staff and other science organizations sharing information about a wide range of community science opportunities. The day will also feature live wildlife shows, bird and nature walks for all ages, birdhouse building demos (and training on how to report data on the birds you observe there to the Maine Bird Atlas), food trucks, face painting, and more! All of this leads up to a very special live broadcast of PBS’s Nature on April 29, 30, and May 1. Modeled after the BBC’s popular Autumnwatch program, American Spring LIVE will broadcast from locations ranging from a sheep farm in Union, Maine, to a cave of hibernating bats in Texas, with stops in Yosemite National Park, the Florida Everglades, and more. Back in Ms. Reimann’s class, the students wrap up at their final stations and regroup to end the day. Ms. Reimann asks for some observations about what they learned, what it made them excited to learn next, and what they appreciated about the process. There’s no denying it. Especially the part about being cool…especially when they have their bins. This article originally appeared in the Spring 2019 issue of Habitat magazine. On the Maine Audubon website there is a button for registering for the April 12th event on native plants…HOWEVER …when I click on that button it takes me to NEWildlife…where there is fantastic information but it is not easy to find where to actually register for this Maine Audubon event which is taking place in Falmouth….seems to be confusing…thank you.